Gift certificates are available for birthdays, anniversaries, family or corporate gatherings, and other special occasions. Rates start at $99.00. Corporate rates are available during the week, please inquire. 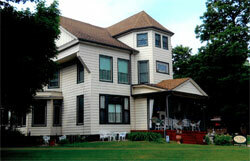 Aunt Daisy’s is a central Illinois Bed and Breakfast located in a century old home, we are unable to accommodate children under 18. All rooms are non smoking. 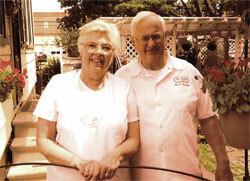 Aunt Daisy’s B&B is the loving creation of two of the most loving and wonderful people we know; Our parents. They have shared over 50 years together, working, collecting and preparing for this, a lifelong dream they launched over 16 years ago. They both have an active appreciation for wonderful people, food and hospitality. We cordially invite you to spend a night, a weekend or even a bit longer with us, and enjoy them all. 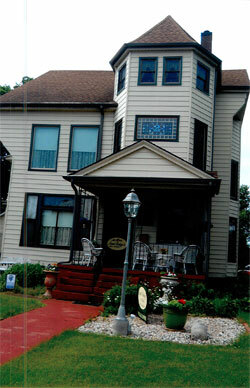 Aunt Daisy’s is only 2 blocks from downtown Kewanee, where the popular Good’s Furniture store is located. Goods is the premier furniture store for the northern half of the state. Good’s occupies several buildings in downtown Kewanee, and is a must see when you visit. The Iowa gambling boats are a 40 minute drive west. 5 miles north on rt78 is Johnson Sauk Trail State Park, where hiking, fishing and picnicking are available. Bishop Hill, a 19th century Swedish Settlement, is also nearby. The local theater shows first run movies nightly, and is within walking distance. 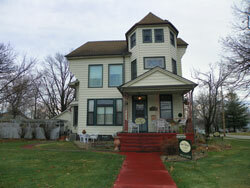 Antique shopping as well as local auctions can be found in Kewanee and several other small towns in the area. Golfing at the Kewanee Dunes Golf Club or the Kewanee park golf course can be arranged with advance notice. Both are excellent courses, with less traffic and better rates than most golfers are used to! 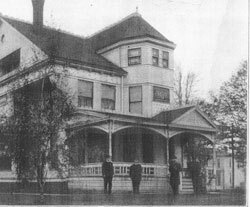 Aunt Daisy’s is named in honor of Michele’s Great grandmother, Daisy Thurman, who was an innkeeper over a century ago during the St. Louis Worlds Fair of 1904. Her photo hangs in a place of honor here. We are very proud of you, Mom and Dad!